DETROIT - February 20, 2012: With the turn of a key or push of a button, starting a car today is taken for granted. 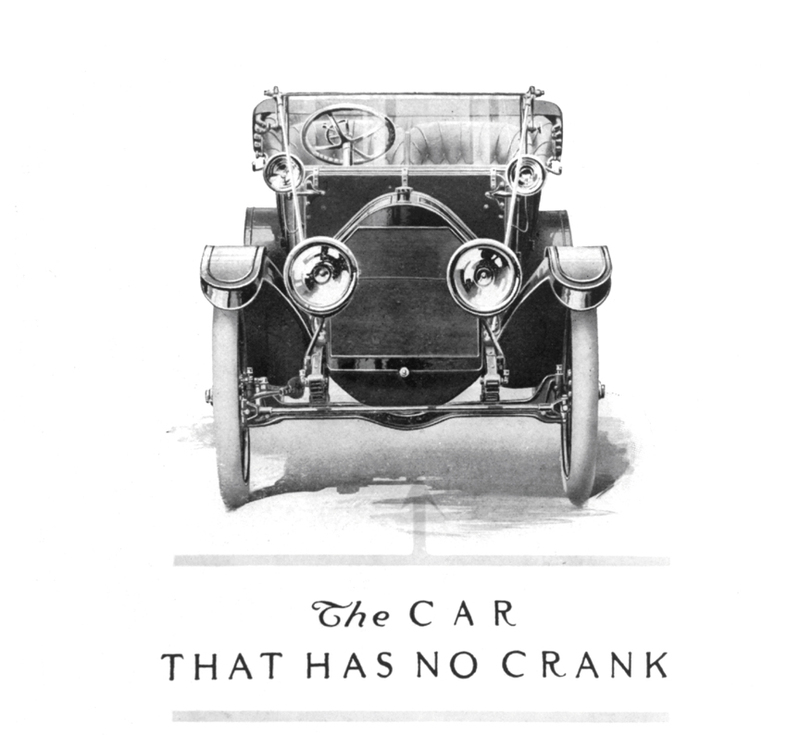 But a century ago, the electric starter that debuted in the 1912 Cadillac Touring Edition helped establish Cadillac’s reputation as a test bed of technology and innovation. Before the electric starter, it took a hand crank, a lot of muscle, and a bit of hope to start driving. “Hand cranking was the No. 1 injury risk in those early days of the automobile,” said Greg Wallace, director of the General Motors Heritage Center, referring to the kickback on a crank handle that could break an arm, or worse. As cars grew larger and purposeful, so did the engines and effort required to start them. It was so difficult, in fact, that it gave rise to the term “cranky,” which often described someone’s mood after struggling to start a car. Cadillac founder Henry M. Leland, who had already pioneered electric lights and electric ignition on his cars, worked closely with Charles F. Kettering, the inventor of the electric starter, to incorporate the device into his cars. The electric starter also was GM’s first electric motor – a core business today anticipating the growth in the electrification of the automobile. Before the electric starter, Leland was an expert machinist and precision manufacturer. A few years earlier, he devised component standardization and interchangeable parts. Soon after the electric starter, Cadillac would be the first to introduce the V-8 engine and the synchromesh transmission for easier gear shifting. Cadillac was also the first car company to offer a fully enclosed car body as standard equipment. “As a premium brand even in its earliest days, Cadillac positioned itself as a technology and innovation leader as a way to set it apart from the dozens of other auto companies,” Wallace said. Among the more visible Cadillac innovations beginning in the 1920s were designer bodywork and color lacquer paint. Later, Cadillac would innovate design with sleek, curvaceous body styles and jet-inspired tail fins. Cadillac introduced the first automatic climate control and heated seats. Twilight Sentinel automatically turned on and off headlamps, and the first tilt-telescoping steering wheel helped drivers feel more comfortable behind the wheel. All were Cadillac firsts. 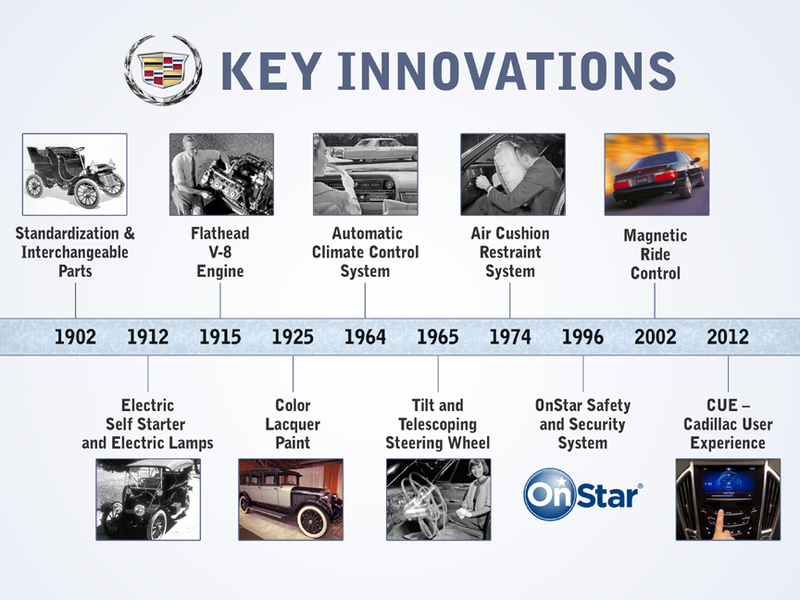 In more recent years, Cadillac was the platform for many high-tech innovations. It pioneered the air-cushion restraint system 1974 – a precursor to modern air bag systems. In 1996, Cadillac vehicles were the first to include OnStar, the leading on-board security, communication and diagnostic system. In 1999, Cadillac introduced the first automotive night vision system. Magnetic Ride Control, the world’s fastest-reacting suspension technology, was introduced by Cadillac in 2002. Today Magnetic Ride Control is a crucial element in the performance of Cadillac’s CTS-V and Escalade models, as well as the upcoming XTS and ATS sedans. It’s been adopted by a few other automakers on a handful of elite sports cars. Cadillac expands significantly in 2012, with new advanced technology elements CUE, a new user experience for in-car connectivity that will be a signature feature of the 2013 XTS and ATS. CUE recently received a Popular Mechanic’s Editors’ Choice Award at the 2012 International Consumer Electronics Show.